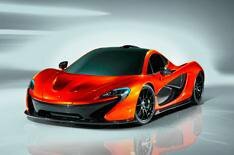 McLaren P1 supercar revealed - updated | What Car? This is the McLaren P1, the supercar that will be the unofficial successor to the iconic McLaren F1 when it arrives in production form in a year's time. The P1 made its debut at the Paris motor show, where McLaren confirmed that further details including powertrain and technical information will be revealed 'early next year', shortly before sales begin. First deliveries are expected at the end of 2013. The new car not only embraces the design language showcased on McLaren's MP4-12C supercar, but exaggerates it with deep, scalloped flanks, a relatively short nose and an extremely complex rear end that blends a high-mounted central exhaust, a thin surrounding line of LED tail-lights and a complex mesh grille. McLaren hasn't revealed engine information for the production version of the P1, but it's believed to feature another twin-turbocharged powerplant a logical development of the 3.8-litre, McLaren-developed V8 that features in the MP4-12C. McLaren has confirmed that the P1 will have a power-to-weight ratio of more than 592bhp per tonne. It also expects higher levels of downforce than any current road car 600kg at well below maximum speed. Also confirmed is a large rear wing, which adjusts automatically to boost downforce and optimise aerodynamics. It can extend rearwards by up to 30cm on the race track, 12cm while on the road and acts as an air brake when deployed. The rear wing works together with two flaps mounted under the body ahead of the front wheels to boost handling, braking and straight-line performance. The P1 is a mid-engined design that uses a carbonfibre monocoque. McLaren has also developed a safety cage called MonoCage, which is a development of the MonoCell used in the MP4 12C.